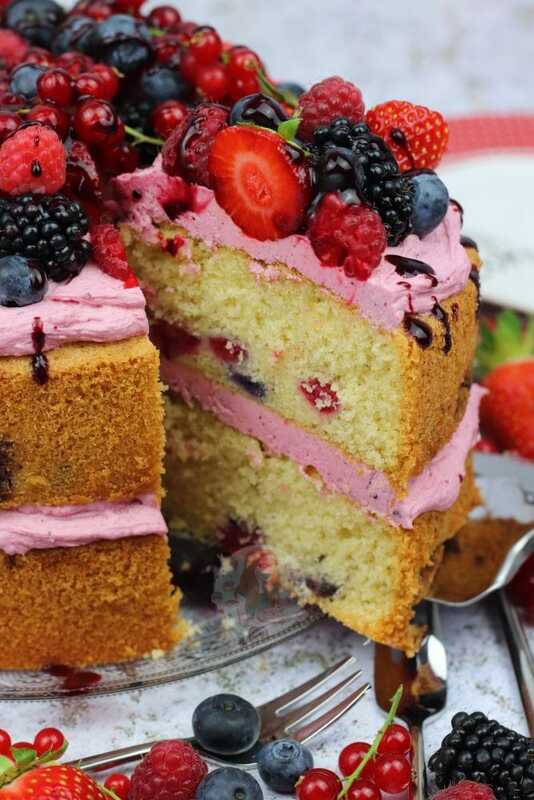 A Two Layer Summer Berry Cake stuffed full with all your favourite Summer Berries, with a Summer Berry Frosting, and even more Berries on top! It’s summer, and I HAVE HAD ENOUGH of all this sun. I am the summer grinch basically. 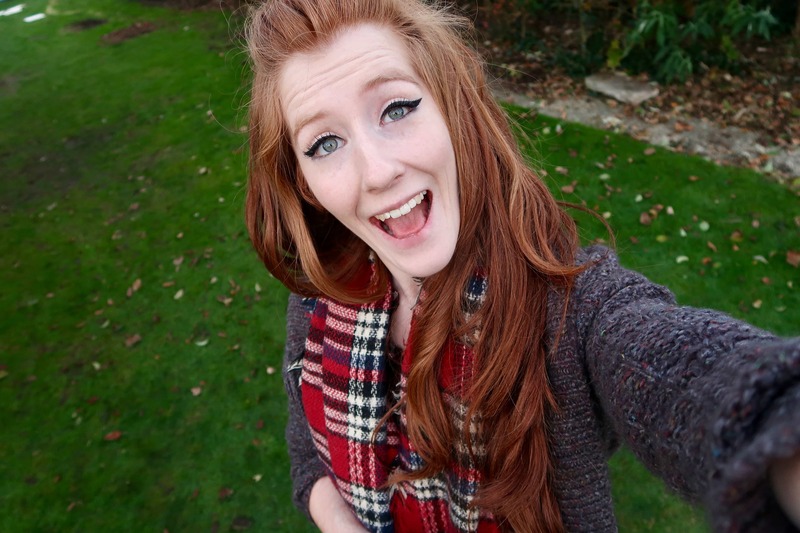 I am a redhead, with very pale skin… and I hate the heat. Even more so, baking in this heat is a bit of a struggle to be honest if you have to be in the kitchen all day, but I still crave cake. I am a winter gal, but… I love summer berry flavours. Honestly, locally grown, and DELICIOUS fresh summer berries are the best treat to have. Recently I posted my Summer Berry Smoothie recipe because I am just so in the mood for berries all the time, but as people don’t like my ‘healthier’ recipes so much, I decided to make a Summer Berry Cake instead!I will admit that I made this in the morning and then decorated in the evening to avoid the heat during the day.. but you might be lucky and not have a kitchen that gets as hot as mine! But anyway… look at it. 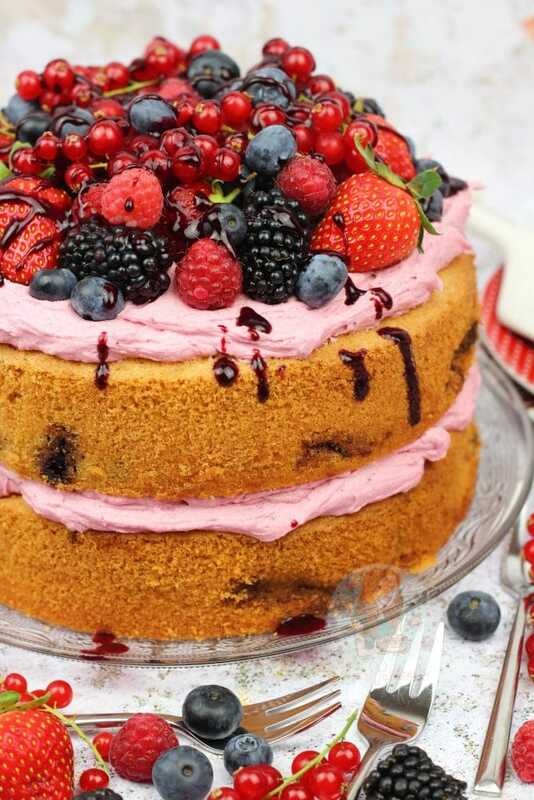 This Summer Berry Cake is fresh, fruity, light, and delicious. I did decide to go for a two layer cake in comparison to a three layer cake like I did with my Eton Mess Cake, because some people only want two layers. The amount in the sponges are actually the same, but I love a chunky sponge designed to feed many. I love a decent cake slice, I’m not here for thin and sad looking cake. I realise not everyone loves a massive slab of cake, but you can easily cut a thinner slice! Either way, this cake is delightful. It’s a bit of a shock and horror moment that there isn’t any chocolate in this cake because I do LOVE chocolate in a bake, but this is just something else. 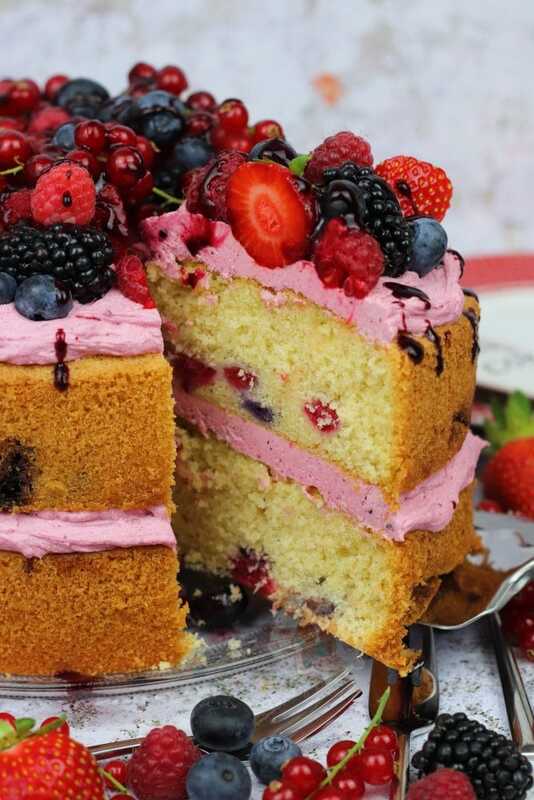 It’s the fruitiest cake whilst also being so incredibly fresh. 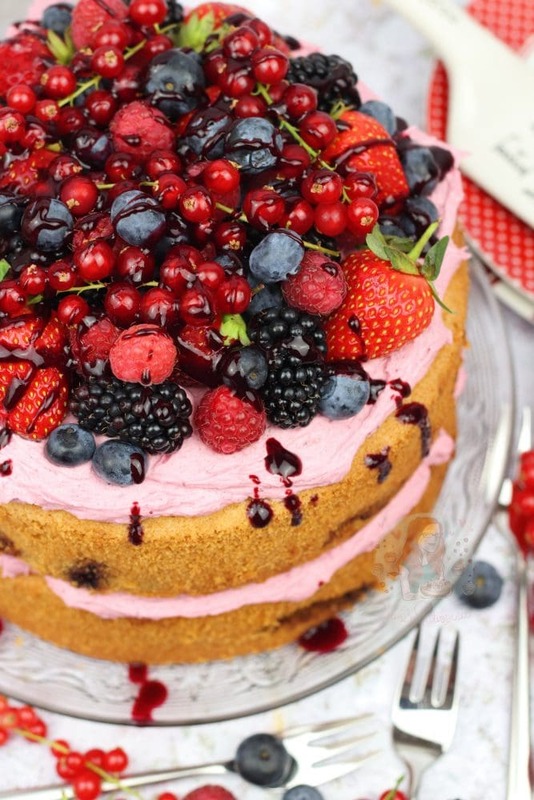 Using your favourite summer berries in the cake means you get the flavour you want! I went for a mix of Raspberries, Strawberries, Blueberries, Blackberries and then some red currants on the top. 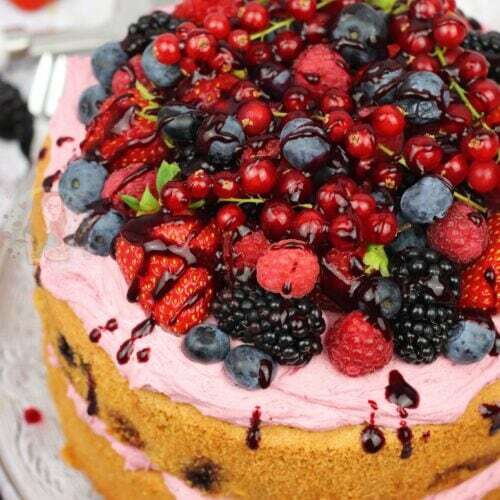 Using your favourite berries in the cake, and in the homemade coulis, and then the decoration on top? Dreamy. I didn’t use red currants in the actual cake or coulis because I might have forgotten I had any at all… but do they really count amongst the Summer ‘Berries’? My boyfriend said they were an imposter, but they looked pretty… so thats that. 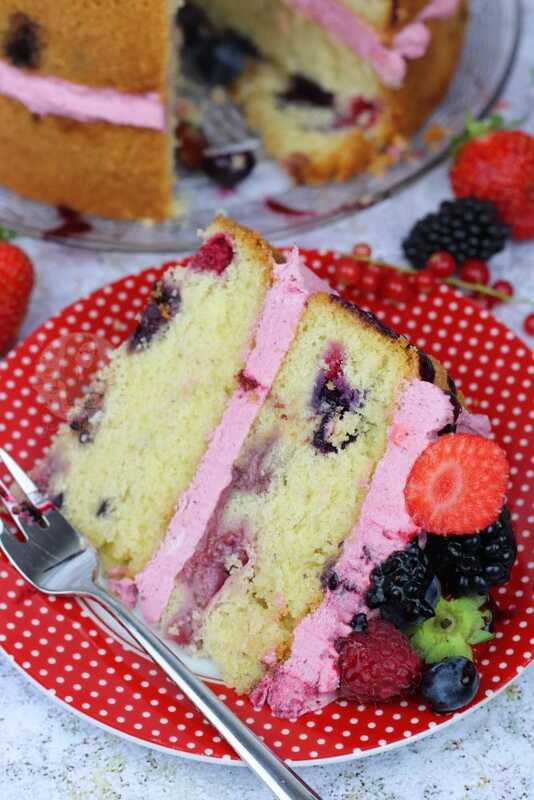 Another recipe I adore in the Summer Berry theme is my Summer Berry Cheesecake and this is literally the cake version. I adore it because every bite is fruity, and because its more than one fruit you get so many different flavours in each bite. The different textures as well, makes it even better. 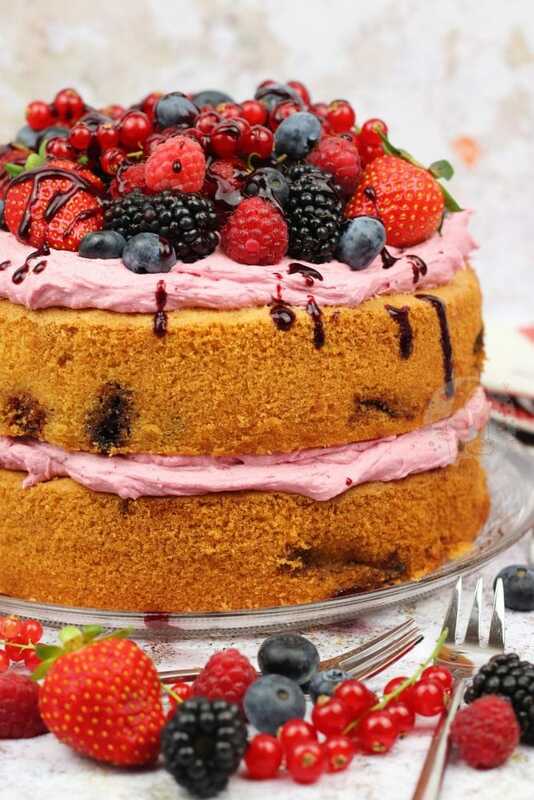 I love how soft the fruit makes the cake, keeping it moist, yet still deeeelightful. Making the Coulis yourself is completely optional, as you can easily buy a jar from the supermarket.. but I love how you can basically make this coulis whatever flavour you want. For example, it could be made up of one fruit, or two, or 10 if you wanted. I generally find that the best flavouring is an equal mix of ripe berries. I find if you use berries that are under ripe, they don’t have any flavour. However, seeing as the sun is STILL AROUND… berries have no problem with being ripe. Usually, they’re overripe, so perfect for making coulis with. 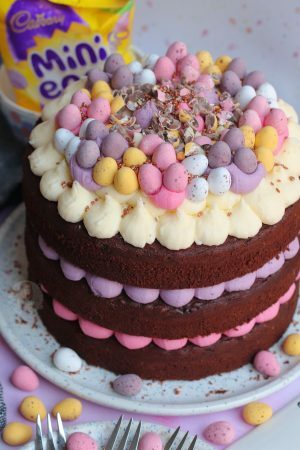 You can easily make a smaller cake, but why would you want to?! Either way, your fruit might sink a little… and you can try dusting the fruit with flour before mixing into the cake batter, but sometimes this does absolutely nothing for it. I tend to find the longer the cake is in the oven, the more the fruit sinks… but also if its a thin cake batter, they will sink anyway. Preheat your oven to 180C/160C Fan, and line two deep 8"/20cm tins with parchment paper. Add your Butter, Sugar, Self Raising Flour and Eggs to a stand mixer bowl (or other bowl if you don't have a stand mixer) and beat together till smooth. Alternatively you can beat the butter and sugar till light and fluffy, and then add in the Flour and Eggs. Fold through the fruit, and split between the two tins. Bake in the oven for 40-45 minutes, or until baked through. Sometimes because of the fruit it can take a little longer to bake, so keep an eye on it. A skewer should come out clean, and the cake shouldn't bake a bubbling/crackling sound when out of the oven. 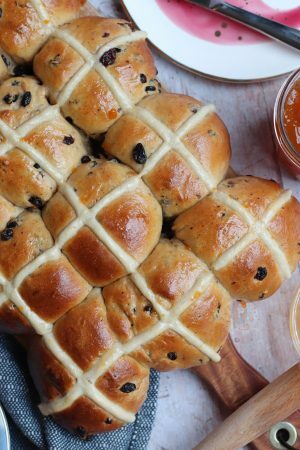 Once baked, leave to cool in the tin for 20-30 minutes, and then remove carefully and cool fully on a wire rack. I find it easier to keep the parchment paper on the bottom of the cake when cooling because of all the fruit. Whilst the cake is cooling, make your coulis. Alternatively, you can do this at any time and store it in the fridge. Add your fruit to a medium sized pan. I cut the tops of my strawberries and halve/quarter them depending on their size so they're the same size as the raspberries. Add your the sugar to the pan, and heat the mixture on a medium heat. Stir it often so the sugar doesn't catch, and mash the fruit down as it softens. Blitz the mixture so its smoother, and then pass it through a sieve to get rid of any seeds/lumps. Leave the coulis to cool fully. Store it in the fridge whilst not using for up to 4 days. Beat room temperature Unsalted Butter (NOT STORK OR A SPREAD) for a few minutes so its really smooth and supple. Add in the icing sugar and beat again. Add in the coulis and beat till smooth. Put your first layer of your cake onto a plate, and slather on half of the buttercream. Add the second layer of the cake, and slather on the rest of the buttercream. 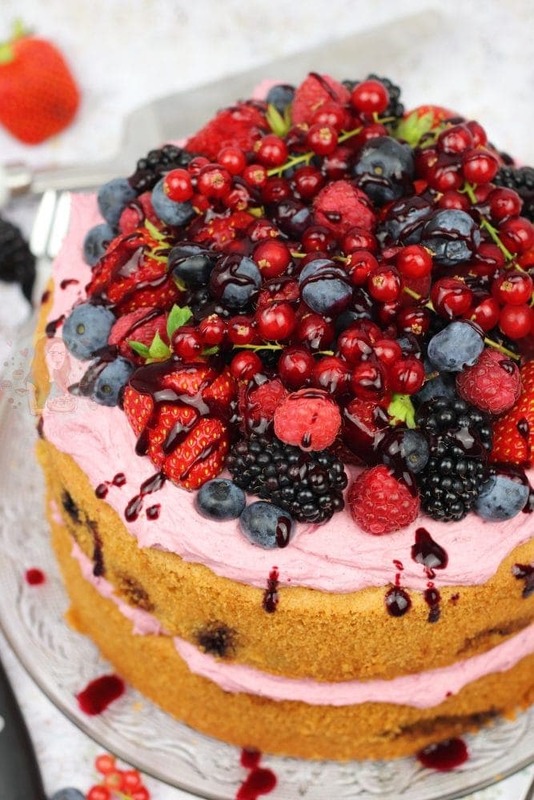 Decorate the cake with the Berries of your choice, and a drizzle more of the Coulis! This cake should really be stored in the fridge because of the amount fresh fruit, but it does make it slightly firmer once refrigerated. Its best on the day of baking. 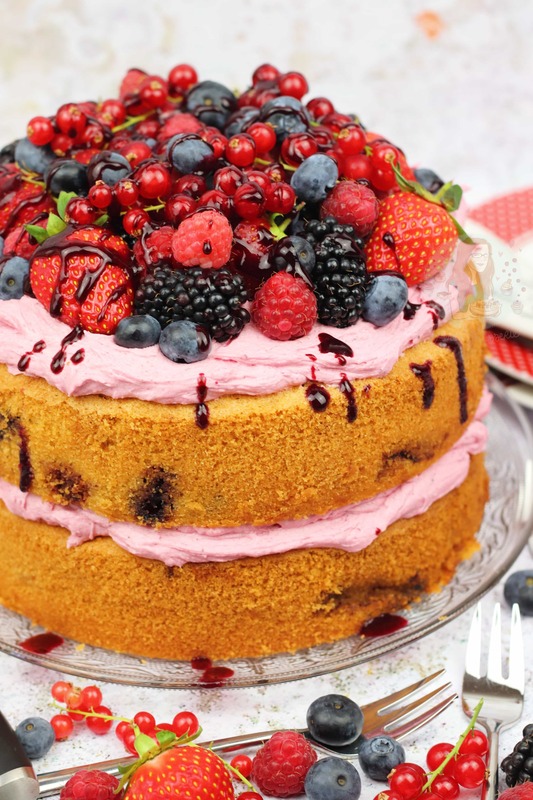 Frozen berries will produce more liquid when baking so it might take longer to bake. You can easily use any shop bought fruit coulis if you don't want to make it! 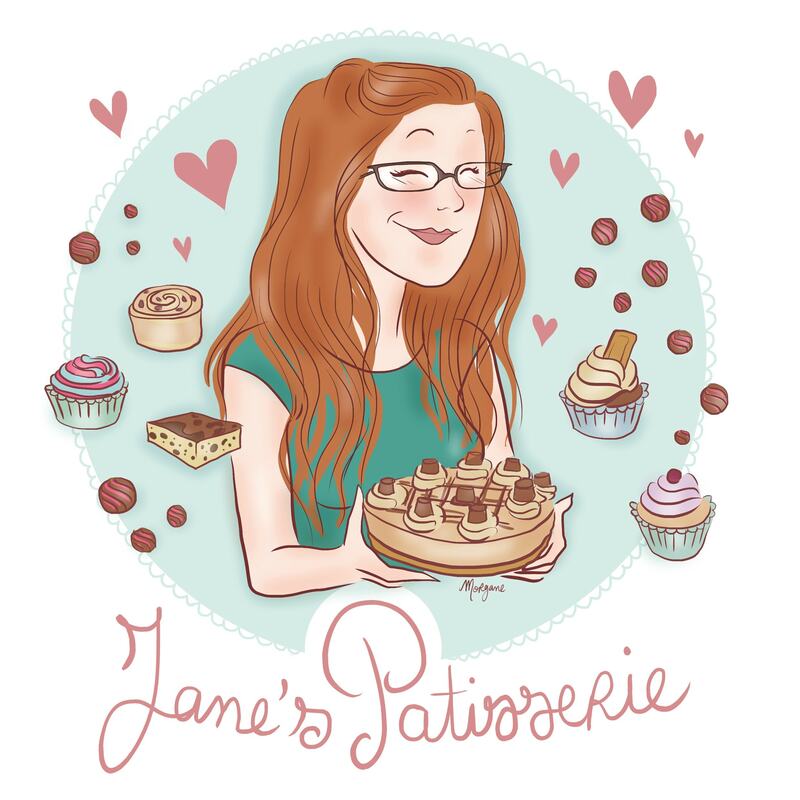 Find my other Cake & Summery Recipes on my Recipes Page! Older Next post: Rolo Cookies! Newer Previous post: Twix Cheesecake! For 9″ Tins, you would need to add another 1/3 on, so 400g Butter for example. For 10″ Tins, you would need to add another 2/3 on, so 500g of Butter for example! Many thanks for your reply Jane, that helps thank you! 1. One cane never, ever have too much hot, blindingly bright sun! 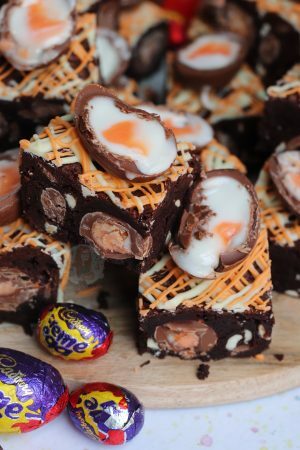 2.I have made several of your recipes and love them! Hahah I wish I got on with the sun more but I really don’t haha! And thank you! !